This is short set from Dr. Hook & The Medicine Show recorded at Shel Silverstein’s Houseboat, Sausalito, San Francisco, CA and broadcast on Danish Television in 1972. 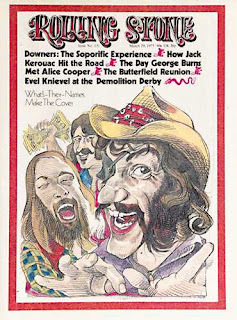 Dr. Hook & the Medicine Show, shortened their name in 1975 to Dr. Hook, They formed around Union City, New Jersey in 1967 as The Chocolate Papers. They enjoyed considerable commercial success in the 1970s with hit singles including "Sylvia's Mother", "The Cover of the Rolling Stone", "A Little Bit More" and "When You're in Love with a Beautiful Woman". In addition to their own material, Dr. Hook and the Medicine Show performed songs written by the poet Shel Silverstein. The band had eight years of regular chart hits, in both the U.S. and the UK, and greatest success with their later gentler material, as Dr. Hook.